The name itself summons up visions of many of us, dressed in goatee beards, flowing white robes with burnouses, lined up with those thick leather gloves and magnificient-looking, keen-glanced birds of prey, racing them. It also conjures up fancies of some of us, astride birds with tiny reins and tinier saddles, flying through the air competitively, driving our birds on with worms dangled before their beaks. A Black-Shouldered Kite, handsome in the monsoon wind. Pic: Deepa Mohan. Wake up, wake up. This is a bird-watching race, actually. People should form teams of four and they will be given log-books and a checklist containing all the known bird-species of the region; they will go about (charge about?) all day in the environs of Bangalore, seeing how many they can see, and come back and file their reports. Obviously the team that has sighted the most bird-species is going to win. I was full of enthusiasm when I heard about the bird race last year. The bird race is sponsored by HSBC bank, and is organized by various bird-lovers of Bangalore, a fairly close-knit fraternity who go under the name of "Bngbirds". It was conducted for the first time last year. The Bangalore Bird Race is on Sunday, January 20, with the registration having closed on Jan 15. More than 250 teams have registered for the event so far. The evening prior to the race, team leaders will take the checklist of various birds of the Bangalore urban area from the organizers, and on Jan 20, will spend the day going to various areas, trying to see how many on the checklist they can see and…er… check on the list. Teams assemble at the common venue by 6 pm in the evening, and over a convivial dinner, exchange notes, and disperse. I must tell you that at my level of expertise I am sometimes not able to tell the tail of a bird from its head–which the bird sometimes tucks into its wings just to confuse me further. The rules said there must be at least one expert bird-watcher in the team (if an expert birder said he had seen a Forest Wagtail, that would be much more credible than my making the same claim!) This was where I started imitating bird behaviour, scratching my head feathers with my talons, racking my bird brain. How was I going to find an expert bird-watcher? Of course I know an expert birder. I know SEVERAL expert birders. But the point is, that most of them are likely to be the judges of the bird race, not its participants! They are all seasoned veterans who look into the unfathomable shadows of the trees and announce, "That’s the Chloropsis". I am not kidding, you non-birding types…there really is such a bird; beginners like me would call it the leafbird, if we could ever spot one, that is. Which brings me to the other reason why I would not be able to get a seasoned birder to be on my team. Obviously, a good birder would want his team members to help him or her spot the most number of birds and win that prize. So who would want to be on the same team with someone who was likely to spot, oh, three birds in as many hours, and be told, gently, that they were the Mynah, the Rock Pigeon, and good old Corvus Splendens? Another thing about the expert birders is that everyone will be fighting to get them on THEIR teams. What chance would I stand in the melee? None. But I did not despair. I managed to trap three of my kind-hearted birder friends into forming a team with me. It helped that one of them had already registered. He had said, "I have no team-mates. I have no car." I told him, hey presto, he had these now; the only thing that he didn’t have was an outside chance at even one of the prizes. Now that I was sure I was going to participate, I started looking at the rules in detail. And I was much struck by one sentence, which said, right after telling me that a checklist of the birds of the region would be provided : "If you see a species which is not on this list, please write it down." 2. The Bald Eagle (well, I did see many of them some time ago). 3. Bird of Paradise (I definitely saw these in someone’s garden). The Common Coot, often seen in Bangalore lakes. Pic:Deepa Mohan. But we had plans, never fear. Plan A, of course, was to spot as many birds as we can and turn in our log book. And there was the evil Plan B, which is to creep about behind an expert team and as soon as they spot something (they would exclaim its name in excitement) tick it off in our checklist. There is the even more evil plan C where we dig out the field reports from the archives of the local birdwatching society, and tick off everything found on the best of them. (There are, helpfully, several such field reports, which just say, "I went to XYZ Place. 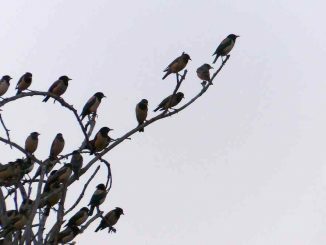 I saw…", and a numbered list of birds follows, the number often going up to 133.) Plan D called for us to go off on a picnic and join in blithely and shamelessly for the dinner at the end of the evening. We even had plans of opening our birdbooks and and start swaying to and fro, repeating, monotonously, "Bright-Headed Cisticola (no, that is not a carbonated beverage), Red-Faced Liocichla (not an embarassed Italian), Rufous-Tailed Shark, sorry, Lark"….. In the event, I must say, our team turned in a respectable total of 96 species, and the winning total was 113. We had a lot of fun that day, and hope to repeat that this year! Great Backyard Bird Count, it’s a wrap! A birding enthusiast recounts his experience at the Great Backyard Bird Count 2016, and on the joys of birding solo. Nice. Loved the way you have narrated your experience with such a funny tone.